Following a mysterious treasure map into a spectacular underground realm of twisting passages, outrageous booby-traps and a long-lost pirate ship full of golden doubloons, the kids race to stay one step ahead of a family of bumbling bad guys… and a mild-mannered monster with a face only a mother could love. 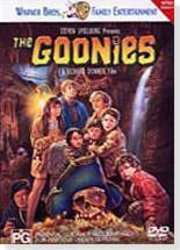 A family adventure classic from start to buccaneering finish, The Goonies is a cinematic treasure trove of breathtaking action, dazzling effects and shiver-yer-timbers thrills! A classic adventure. Gosh, I can`t believe this movie is already 17 years old. I remember watching it as a teen, so when I heard the DVD had been released, I immediately bought it. Thankfully, I wasn`t disappointed at all - on the contrary - it`s a great disk. The video transfer is good. While the picture isn`t 100% sharp, I could not spot any compression signs. The movie is clear of any defects and the big sets (which are not common anymore, nowadays) look just great. The movie includes several CG elements, which look a bit ridiculous, but hey - that was then, this is now. The DD 5.1 soundtrack is very good. The surrounds are used occasionally and the sound envelope is quite good, especially during the underground scenes. The menus are beautifully animated with sound. The extras include a (ridiculously 1980`s) music video, a behind the scenes look, 3 deleted scenes (including the infamous octopus scene). But the real treasure on the disk is the commentary. Warner gathered the director and all of the teen leads for this, put them in a small theater and filmed them as they were watching the movie. The commentary track is actually a separate video track that includes both sound and video of the entire group watching the movie and making funny and interesting remarks. The commentary is both informative and fun to listen to and watch. Don`t miss it. Bottom line - a truly enjoyable classic with a great disk. Buy it.